Korean inventors discovered a way to transform carbon dioxide into electricity and hydrogen - Альтернативная энергетика - статьи и новости в мире и в Украине. A group of scientists from the UNIST Institute created the technology for producing electricity and hydrogen, during which the splitting of CO2 occurs. 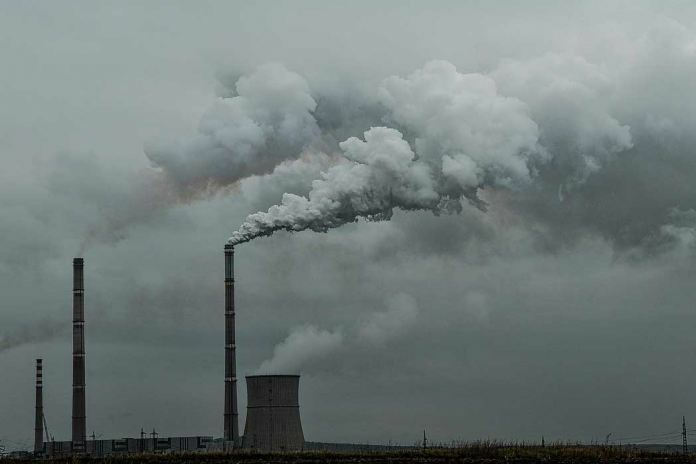 It is an excessive amount of carbon dioxide that leads to global warming, so scientists around the world are working on inventing ways to reduce CO2 in the atmosphere. Professor Kim Gong Ta led the team of scientists. Scientists from the eminent University of Georgia also took part in research. Scientists have created special equipment, which is called Hybrid Na-CO2. This innovative equipment is able to work non-stop for about a thousand hours. The device uses the process of utilization of CO2 in aqueous solution. 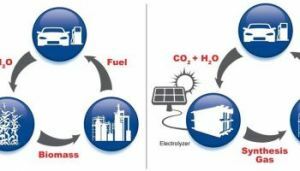 Ultimately, the equipment allows us to obtain electricity and hydrogen as derivatives of this process. Professor Kim said that his team joined the world scientific trend – carbon dioxide processing. The basis of its carbon dioxide utilization method is the modification of CO2 molecules, which have a high degree of chemical stability. According to the professor, his team was able to solve the problem by dissolving CO2. A huge amount of carbon dioxide generated by man-made processes, falls into the waters of the oceans. There, CO2 is converted to acidic compounds. This fact prompted the Korean scientists to the idea of ​​creating a new way to dispose of harmful emissions. The researchers took as a basis the process of dissolving CO2 in water to produce an electrochemical reaction. When the level of acidity in water increases, the number of protons increases. Accordingly, there are more electrons too. Scientists said that their discovery could be used in the manufacture of new generation batteries. These energy storage devices will generate electricity by dissolving CO2. 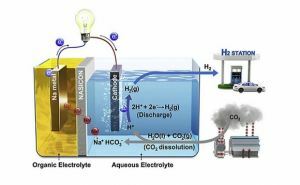 The catalyst is located in the aquatic environment and is connected by wire to the cathode. After the release of carbon dioxide into the aquatic environment, the main chemical process is triggered – the splitting of CO2 and the production of electricity. In addition, hydrogen is released during this reaction. Scientists estimate conversion efficiency at 50 percent. During testing, innovative equipment has shown that it can function for thousands of hours. During this time, no damage was recorded. Professor Kim is confident that this technology will be the beginning of a mass of scientific discoveries in the field of reducing CO2 levels. A similar development was presented by a group of scientists from the Netherlands. They created a special electrochemical storage device that combines the absorption of CO2 with the production of electricity. The principle of operation of an electrochemical battery is to convert the water component into an electrolyte. In addition to water, ethanolamine solution can also be used. The reaction in the battery is started by passing gas through it, which is formed during the combustion of fossil fuels. During this chemical process, CO2 is reacted with H2O. The result is the formation of carbonic acid. This compound has weak chemical bonds, therefore it decomposes into hydrogen ions and bicarbonate. According to experts, the CO2 currently in the atmosphere should be enough to generate 1570 TWh of energy for one year. This amount of electricity is approximately 1.5 times the demand of the Russian Federation and Japan.